superphoebe: Recipe: very hippie brown rice crispy treats! 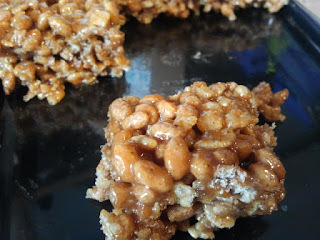 Recipe: very hippie brown rice crispy treats! have you seen my friends' Jen & Jenn's food blog, LaKitchenette? Well, it's filled with fantastic recipes that satisfy those comfort food cravings with food that is not so harsh on your body. I've been doing a little detox cleanse diet this month, and really wanting something sweet and snacky, so I was thrilled to try tweaking Jen Wick's recipe for sesame rice krispy treats. Combine coconut oil, nut butter and liquid ingredients in saucepan over medium heat, stirring frequently until uniform and glossy. While it's getting nice and warm, toss the brown rice and cocoa powder until the rice is evenly coated in it. Allow warm mixture to cool slightly before pouring over brown rice krispies. Pour into lightly greased pan and flatten the top with a spatula. Refrigerate overnight to firm. Cut into squares.